At this time, it is difficult to determine exactly how RRA infest many indoor growing facilities. The winged females could enter the facility through vents and doors. The eggs could also be present in substrate, regardless of the type of media. Heat sterilization of media could help protect indoor production from infestations of RRA. 30 minutes of 170 degree heat has the potential to sterilize media and control overwintering RRA eggs. If you have determined that you have RRA in your plants, it’s important to act quickly to control the population. If you are an organic grower concerned about Minimum Residue Levels or testing for pesticide residue in finished crops, consult your approved list of products before making decisions that effect the salability of the crop. Approved mycoinsecticides can significantly suppress root aphid populations. The mode of action of the mycoinsecticide Botanigard (Beauveria bassiana) is unlike any conventional insecticide. The applied spores infect directly through the outside of the insect’s cuticle (the skin). Spores adhering to the host will germinate and produce enzymes that attack and dissolve the cuticle, allowing it to penetrate the skin and grow into the insect’s body. As the insect dies, it will change color to pink or brown, and eventually the entire body cavity is filled with fungal mass. 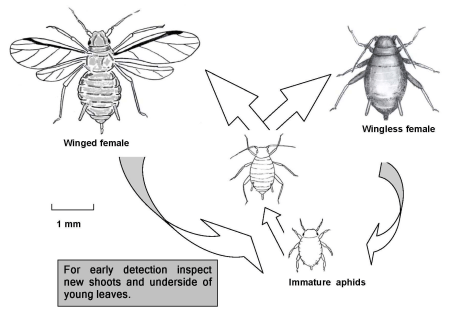 The most common visible indication of insect death is a discoloration of the larvae or pupae. It is not necessary for a white fungal growth to occur to know the product is working; the insect is killed before this happens. Another mycoinsecticide called PFR 97 is Isaria fumosorosea, the active component in PFR–97™ 20%. WDG, is an entomopathogenic fungus found in infected and dead insects as well as in some soils that infects many insect and mite pests that occur on foliage and other above-ground plants, as well as many soil-dwelling pests. This product has a short shelf life and must be stored in refrigeration. Neem (azadirachtin) and Pyrethrin can also be employed to control populations of RRA. The products can be applied as a tank mix or used alone. Do not rely on a single active ingredient for control. Growers will occasionally contact beneficial insect suppliers who sell products online or in a store front. It is important to note that beneficial insects and entomopathogenic nematodes have not been proven to control RRA. Monitor expectations about the efficacy of soil dwelling beneficial insects and nematodes. I recommend that you implement these tools after you have controlled populations with approved soil drenches of biopesticides. Soil beneficial insects also control many other types of pests such as fungus gnats, thrips and shore fly. Green lacewings belong to the family Chrysopidae and are found widespread throughout North America. The larvae are voracious predators that feed on aphids, small caterpillars, mites, whiteflies, scales, mealybugs, thrips, psyllids and other soft-bodied insects. 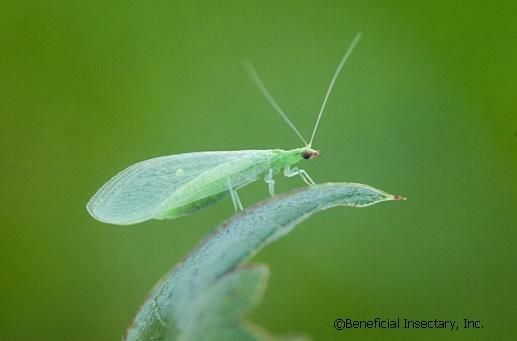 Green lacewings are widely used in augmentation biological control to suppress pests. Green lacewing can be released in an enclosed growing environment to control the winged and leaf feeding stages of RRA. Maintain a very close spray interval of biopesticides when mitigating infestations of RRA. Approved biopesticides should be applied weekly. You can tank mix nematodes with products like Botanigard and PFR 97. This method provides multiple modes of action in one application.